Another new song from No Turning Back! 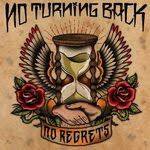 "My blood boils my eyes turn red, what you deserve is what you will get, seek for revenge, vengeance is mine..." No Turning Back has recently posted another track from the upcoming, self-released album No Regrets. Listen to ‘Your Downfall’ here or after the jump. The release date for the album is October 12th 2012.